The business is called "TEEGA INTERIORS" and the tagline is "Styling + Staging". I am looking for a logo for my new business. It's an Interior decor, styling and staging business. I like minimal/thin (yet feminine) lines and letters. I want it to be something eye catching. I would like it to look gentle, but still command a strong presence. I would like the word "TEEGA" to be incorporated in the logo somehow. I like whites/greys/gold/light pinks/navy blue. I have included some photos of what I like. 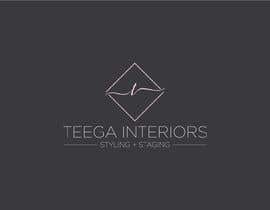 I am looking for thin lines saying TEEGA INTERIORS with the tagline included. Tagline is Styling + Staging. #50 , Please Check. Thanks.